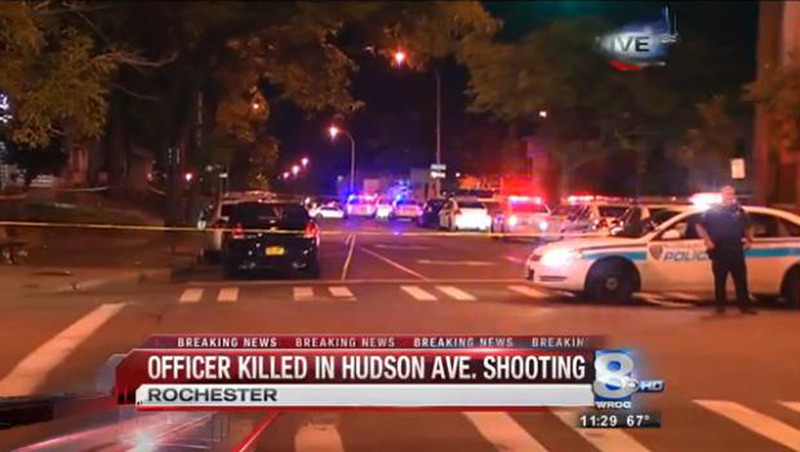 ROCHESTER, N.Y.--Sources have identified the suspect in the shooting of a New York police officer during a chase Wednesday night, reports CBS affiliate WROC. The unidentified Rochester cop was fatally wounded around 9:50 p.m. while pursuing 38-year-old Thomas Johnson III, according to the station. The officer was reportedly responding to a 911 call about a fight in the area. The officer -- who was later pronounced dead at Rochester General Hospital -- is the first member of the city's police force to be killed in the line of duty since 1959, officials said Thursday. The station reports Johnson and a bystander were also shot in the gunfight. Both are currently being treated at Strong Memorial Hospital. The bystander suffered non-life-threatening injuries. Records obtained by WROC from the city's department of corrections reveal Johnson was released from prison only two weeks ago. The suspect had reportedly been living at the Salvation Army. "On behalf of all the men and women of the Rochester Police Department, I want to express our deepest condolences to the officer's family," said Rochester Police Chief Michael Ciminelli. "We in the Rochester community have lost someone very important to all of us. We ask for your prayers and your support during this difficult time." Ciminelli said there are no other suspects and that officers are continuing to investigate.